International Relations Speaker Series: Kenneth Schultz, Ph.D. Presented by the Orfalea Center’s Global Security Hub and the Lancaster Chair in the Department of Political Science. This event is part of the International Relations Speaker Series. 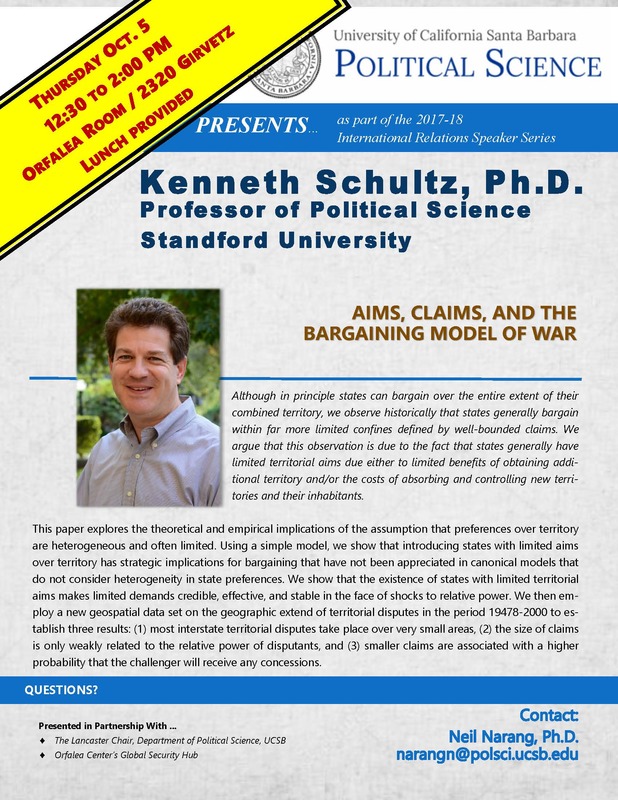 Kenneth Schultz is professor of political science at Stanford University. His research examines international conflict and conflict resolution, with a particular focus on the domestic political influences on foreign policy choices. He is the author of Democracy and Coercive Diplomacy and World Politics: Interests, Interactions, and Institutions (with David Lake and Jeffry Frieden), as well as numerous articles in peer-reviewed scholarly journals. He was the recipient of the 2003 Karl Deutsch Award, given by the International Studies Association, and a 2011 Dean’s Award for Distinguished Teaching, awarded by Stanford’s School of Humanities and Sciences. He received his PhD in political science from Stanford University. Although in principle states can bargain over the entire extent of their combined territory, we observe historically that states generally bargain within far more limited confines defined by well-bounded claims. We argue that this observation is due to the fact that states generally have limited territorial aims due either to limited benefits of obtaining additional territory and/or the costs of absorbing and controlling new territories and their inhabitants. This paper explores the theoretical and empirical implications of the assumption that preferences over territory are heterogeneous and often limited. Using a simple model, we show that introducing states with limited aims over territory has strategic implications for bargaining that have not been appreciated in canonical models that do not consider heterogeneity in state preferences. We show that the existence of states with limited territorial aims makes limited demands credible, effective, and stable in the face of shocks to relative power. We then employ a new geospatial data set on the geographic extend of territorial disputes in the period 19478-2000 to establish three results: (1) most interstate territorial disputes take place over very small areas, (2) the size of claims is only weakly related to the relative power of disputants, and (3) smaller claims are associated with a higher probability that the challenger will receive any concessions.